"Naughty or nice? Better think twice!" 'Cuz Santa Clops is coming to town! 'Twas the fright before Christmas and all through the home, Not a critter was creeping, not even a gnome. The stockings were hung by the chimney with fear, In the hopes that Santa Clops would not come near. And thus begins this monstrous take on the holiday classic "The Night Before Christmas." 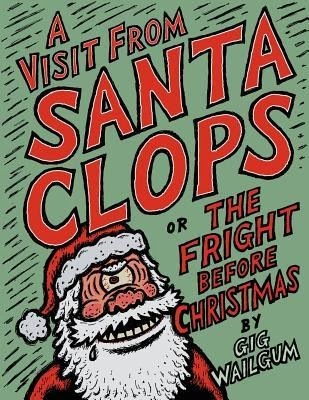 In the story "A Visit From Santa Clops or The Fright Before Christmas" the one-eyed cousin of Kris Kringle, stops by a sleeping family's house on Christmas Eve. The startled and frightened father must confront Santa Clops and save Christmas for his children. This was such a cute book! I love the concept: Santa Clops is Santa Claus' cousin. Santa Clops is a Cyclops from the South Pole. He brings coal to kids who have been bad all year, while Santa Claus brings presents. Santa Clops comes in a sled pulled by flying penguins (cute!). He loads up kids' stockings with coal, according to his list. This story is based on the Night Before Christmas rhyme, except it's about Santa Clops instead of Santa Claus. It centers on one family, with two kids asleep in their beds on Christmas Eve. Their dad hears "a ruckus" outside and checks the window, and lo and behold, Santa Clops is coming to their house! He comes down the chimney and starts to put coal in the stockings. But the dad pleads with Clops on his kids' behalf, telling him that they've been good all year and he must have the wrong house. The illustrations are what made this book so neat. They are perfect for the story: so full of action and emotion that a reader could glean the theme of the story without reading the text. And speaking of the text, the entire story is told in rhyme, along the theme of The Night Before Christmas. The one thing I didn't love about this book is that it contains the word "jerk" in it. If you're careful about what you read to your kids, or what your kids read on their own, that would be worth noting. Overall, I really had such a good time reading this fun, imaginative story! I ended up not reading it to my two year-old because I was afraid Santa Clops might scare her at such a young age, but I think this book would be enjoyed by ages four and up. Recommended!